The average wedding guest will spend a week's wages watching their pals say 'I do'. We're always hearing about the rising cost of weddings but at least for the happy couple this will (hopefully) be a once in a lifetime payment – what about their poor guests? According to a new survey the average wedding guest will spend a week's wages watching their pals say 'I do'. Between gifts, outfits, transport, hen parties and the endless list of extras that go into attending a loved one's nuptials the costs can run to more than €500 a wedding with most of us attending an average of five a year. With money tight, some 13pc of people would turn down an invitation rather than splash out. But according to Ireland's wedding experts, there are some ways to lighten the load. More than two-thirds of women spend more on their outfit than accommodation and Facebook tagging means it's no longer possible to get away with the same frock at every event. "A great way to keep costs down is to rent an outfit," says Naoise McNally, managing editor of OneFabDay.ie. Outlets such as Couture For Hire, The Ivory Closet, Frock n Fabulous and Covet Dublin can supply designer dresses (Couture For Hire has a stunning selection of Valentino and Roberto Cavalli) and often take care of dry-cleaning for as little as €60. "Raid the wardrobe of a friend from a different friendship circle and return the favour when she's going to a wedding," suggests Blaithin O'Reilly Murphy, wedding planner consultant (theweddingexpert.ie). "Most of us are in the same position when it comes to not having enough to buy a new outfit every time, so admit it. Being let loose on someone else's wardrobe can be just as much fun as shopping – even better, because it's free!" Old favourites like scouring the second-hand stores of well-to-do areas and updating looks with accessories or alterations will also keep costs down. Rather than spend €50 on professionally applied make-up for every wedding it could be more cost effective in the long run to invest in teaching yourself. "One-on-one makeup tutorials are really taking off," says make-up artist Adele Miley (adelemiley.com). For €85 Adele's one-and-a-half hour long class teaches a daytime look, nighttime look and tips to stop you spending yet more money on the wrong products. "In the long run, people see it as an investment and it can help pull them out of a make-up rut," says Adele. Of course the question of what you can get away with spending on a wedding gift is the perennial problem. Just recently an attempt at a cheap and cheerful gift hit the headlines when Kathy Mason from Hamilton Ontario had her sweetie-filled food basket branded "cheap and embarrassing" by a furious bride during a very public spat in the Hamilton Spectator. "Typically gifts from a couple of guests together will be in the region of €200 but this does vary between social groups and can be more in rural areas," says Naoise. For a single guest Blaithin puts the figure at between €50 and €150, depending on the relationship and what the guest can afford. 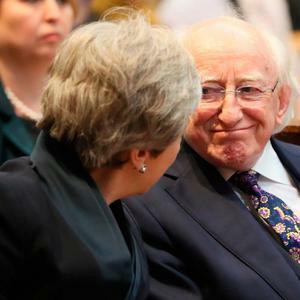 "If €50 is all you can stretch to – and I think a lot of couples realise that money is tight for people at the moment – it might be an idea to club together with a few other budgeting guests and buy something special for the couple like a hot-air balloon ride on honeymoon or a large item off their wedding list," she says. Jane McCoy, managing director of Pretty As A Picture, wedding stationary boutique (prettyasapicture.ie) says: "If you have any skills you can offer the wedding couple (such as making the wedding cake or singing at the ceremony) these can be put to good use on the day in lieu of a gift. "I have created wedding dress portraits, thumbprint guest books and wedding invitations as gifts to friends in the past." However, after attending seven weddings and four hen dos last year, at a total cost of around €5,000, Jane (30), knows first hand how costly being a serial wedding guest can be. "It must be the age I'm at," she laughs. "We tried to do it on a budget, I did my own nails, tan and make-up, we shopped around for B&Bs and our parents looked after the children - but it still all adds up." All the wedding experts agree that forward planning is the best way to save money. "If you see something that would make a nice gift, especially in the sales, buy it there and then," advises Blaithin. "I keep a go to 'gift basket' in the house. Running round trying to buy something last minute is always going to be more expensive. "When you know where the wedding is, keep an eye on deal sites for accommodation nearby," says Claire Malone, managing editor of Mrs2Be. "Being organised is key. "Don't leave it to the last minute or you'll pay higher prices. Also, don't pay for extras you won't use. If you're not an early riser after a serious night of partying, and can't drag yourself out of bed for breakfast, then opt for a room-only rate." "It's also worth ringing around and seeing which friends are going and coming back that evening," adds Blaithin. "The great thing about friends getting married in close proximity is that somebody will usually be pregnant and not drinking so there's a chance it might suit them to give you a lift." To save on the booze bill: "Stick to the wine at the table and pace yourself afterward," urges Naoise. "Do NOT get into big rounds with 12 people at your table!" With weddings often lasting three days and hen parties sometimes extending to a week abroad honesty really is the best policy if you can't afford it. "There's absolutely nothing wrong with going for just one of the nights if you're on a tight budget," says Claire. Blaithin agrees: "Be upfront. Say 'I can't afford this but perhaps we could go out for dinner and drinks another time'." Prioritising spending, forward planning and borrowing can all help save but ultimately "the most important part of any wedding is seeing the couple vowing to spend their lives together," says Caroline Hendry, site editor for Hitched.ie. "Being there to witness that is more important than any of the additional extras." A retort that might come in handy if the bride has a go at you for sending them a cheap food basket.